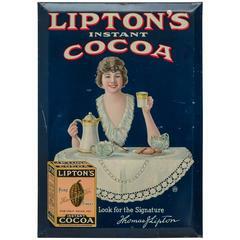 Featured is a beautiful tin over cardboard sign from the Lipton’s Instant Cocoa Brand. Circa 1910. Featured is a beautiful tin or metal sign from the Lipton Tea Brand. This sign beautifully illustrates a round string holder as it’s image, a common item used to help advertise products in the early 1900’s. Featured is an incredible gesso framed advertising lithograph from the Charles A. Pillsbury Company in Minneapolis, Minnesota. This print features their trademark eagle at the time (before the dough boy), and the factory itself in the lower inset view. Circa 1900. Featured is an early cardboard sign advertising the Hershey Milk Chocolate and Cocoa products. The Hershey Company was large, but they did limited widespread advertising in the early 1900’s. Subsequently, collectors today cannot find a large variety of early advertising from this company. 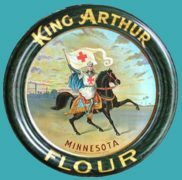 Featured is a colorful tin serving tray advertising the King Arthur Brand of flour which was made in Minnesota in the early 1900’s.